Sam Saunders is a current PhD candidate at Liverpool John Moores University, where he is researching the role of the periodical press on the construction and evolution of Victorian detective fiction. His research explores non-fiction periodical discussions on the police and crime, as well as early examples of serialised crime fiction. Sam has previously written for the British Association for Victorian Studies and is a regular contributor to the Huffington Post UK. He is also completing articles for the Journal of the Police History Society and the Law Crime and History Journal, due to be published later this year. In this post, I intend to highlight the voyeuristic aspects of nineteenth century crime fiction and articles on crime published in mid-nineteenth century periodicals, and relate this to the chronology of crime fiction. I will explore the interest in making the private world of criminality and law enforcement public, and suggest how this aspect of periodical writing can help augment our understanding of the crime fiction genre and its evolution. Worthington here refers to execution broadsides when she argues that they appealed to the voyeuristic interests of the masses and presenting a public view of hitherto ‘private’ spaces. However, this can also be readily applied to Newgate Calendars and other early crime writing designed to ‘render the private public’. Execution broadsides were popular throughout the late eighteenth and early nineteenth centuries, written and sold by peddlers at public executions. They were single-sheet, heavily sensationalised accounts of the lives of criminals, their crimes that led them to the gallows and a usually graphic description of the executions or other punishments. They also usually included a crude woodcut of the execution taking place, and the prose was often accompanied by a piece of penitent verse, usually printed surrounding the details of the crime and a crude, generic woodcut of the execution taking place (see fig. 1). This tension between information and entertainment highlights the execution broadside as a space where a public desire to see ‘inside’ the private arena of the criminal world can be identified. Execution broadsides complemented a spectacle that was already publically visible, and the detail as to why this particular person had been condemned by the state was therefore a matter of public interest. Picking up on the broadside’s popularity, The Ordinaries of Newgate began publishing their own versions from inside the prison. These accounts of criminal misdeeds and executions were known collectively as the Accounts of the Ordinaries of Newgate, and were much less sensationalised than common broadsides. The Ordinaries’ access to criminals also gave them an extra edge over the broadside; they could obtain information that a street-seller could only speculate about. [iv] Their widespread popularity reveals a public desire to see inside the private space of the prison – contextual information surrounding a criminal and a highly public execution proved very popular. Both publications were eventually collated and published as a volume – publications known as The Newgate Calendar(s). The first of these to appear under this name appeared in 1773. [v] These became less focused on executions, and more interested in criminals’ lives. Each story was focused on a specific criminal, their crime and their punishment, and again we see a form of crime-writing that renders a private space public – in this case the life and misdeeds of a stranger, either contemporary or historical. These accounts also often depicted a narrative of the proceedings that took place inside the court-room, another private space that this kind of writing rendered public. There are, however, some aspects that distinguish Richmond from later police memoir writing. It is too biographical – the first half is devoted to Richmond’s childhood and early-adult experiences – his adeptness at playing pranks, his schooling, his first love-interest (who tragically dies early on) and his experiences of early adulthood living amongst gypsies. These details are not completely irrelevant; by using this contextual information the novel creates a sophisticated plot-relationship between the two halves of the story, using details from the first to create the second. For example, the loss of Richmond’s first love-interest disassociates him from emotional ties and allows him to undertake the antisocial occupation of a police officer free from emotional attachments. Secondly, Richmond’s life among gypsies prior to starting as a Runner gives him connections in the criminal underworld which he uses as accomplices or for information in his exploits. This novel is therefore a sophisticated yet isolated example of a police memoir, as later examples of this genre published in the mid-century and in periodicals cannot as effectively use the early life of the character as effectively to set up their narratives. Despite its isolation both chronologically and formulaically, it is an example of a police memoir that continues the theme of allowing readers to see inside a private space, and as such deserves recognising as a milestone in the genre’s development. 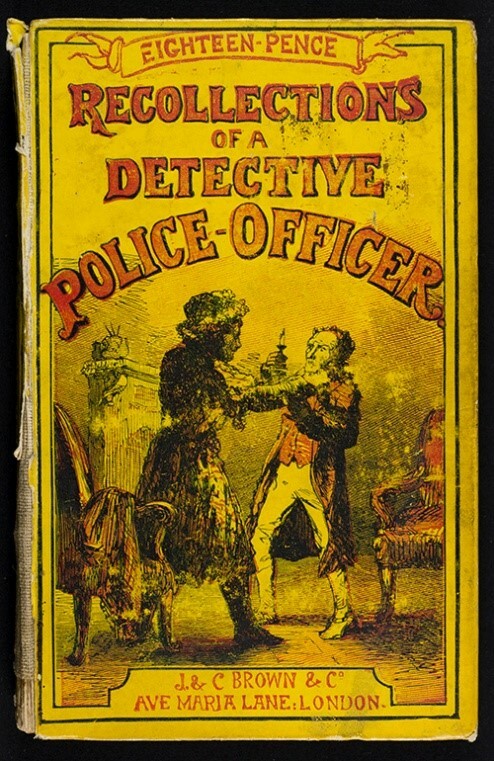 In the 1850s and 1860s, police memoir fiction became a popular feature in periodicals, frequently emerging in the pages of a variety of titles. A prolific author was the largely unknown William Russell – distinct from the more widely remembered William Clark Russell. Russell was a writer living in London throughout the 1850s, contributing significant amount of fiction to periodicals and magazines – notably Chambers’s Edinburgh Journal and The Sixpenny Magazine before its untimely demise. Russell’s earliest example was published in Chambers’s Edinburgh Journal between 1849 and 1853, entitled Recollections of a Police Officer. 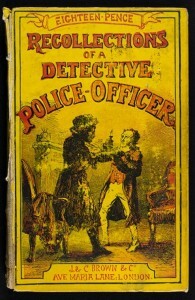 It was an example of pseudo-non-fictional insight into the police force, designed to appeal to the reading public’s curiosity about the police and provide a literary window into the police force. The serialised publication in Chambers’s proved popular enough for the stories to be collected into a three-volume collection in 1856 (see fig. 2). However, it was retitled Recollections of a Detective Police-Officer. This is an aggressive passage with which to open a new set of stories about the exploits from within the police force. It suggests a growing awareness by the author that detectives and police officers are proving to be popular figures in cheap, accessible and widely published literature. Secondly, the idea of ‘detective literature’ here specifically refers to memoir fiction, suggesting that the perceived nature of ‘detective fiction’ at this time was memoir fiction. The passage specifically points to the fact that the point of the genre was to relate the experiences of a real police officer to the reader. This is unlikely to be true, however it suggests the fact that these narratives were specifically designed to appeal to the voyeuristic interests of readers. Police memoir writing performed two overall tasks. It began to blend non-fiction with fiction, as it was influenced by much earlier genres of non-fictional crime literature. By looking ‘inside’ the police force, a police memoir style of writing offered a new perspective to experience criminality for readers by following the police officer, rather than the criminal. These memoir writing narratives did however keep an element of the ‘non-fiction’ marketing that these earlier genres also maintained. The second task that memoir writing performed was help to proliferate understanding of the operational structure and social remit of the police force as an everyday organisation after 1856.The police were often seen as a physical manifestation of Governmental influence in far flung regions away from London, and police memoir-writing allowed readers to get a more first-hand, internal view of the force. It also helped to lay the foundations for later, more recognisable detective fiction.